Leonardo Pisano Bigollo (1170-1250) a.k.a. "Fibonacci"
Italian Catholic mathematician who advocated the use of the numeral system that is still used today (1,2,3,4,5,6,7,8,9,0) and famed for coming up with the "Fibbonacci Sequence." English Catholic Bishop who developed mathematical physics, put forward the first known wave theory of light, and advocated the use of controlled experiments (which led to the modern scientific method). Albertus Magnus (1193/1206-1280) a.k.a. "Albert the Great"
German Catholic Bishop (and Dominican Friar) who, in addition to writing extensively on logic, psychology, zoology, mineralogy, metaphysics, meteorology, astronomy, geography, chemistry, and psychiology, was the first person to isolate a new element (arsenic) in thousands of years (he is also the patron saint of the Natural Sciences). Italian Catholic Bishop (and Dominician Friar) who invented an anesthesia which was one of the most widely used anesthesia up until the nineteenth century. 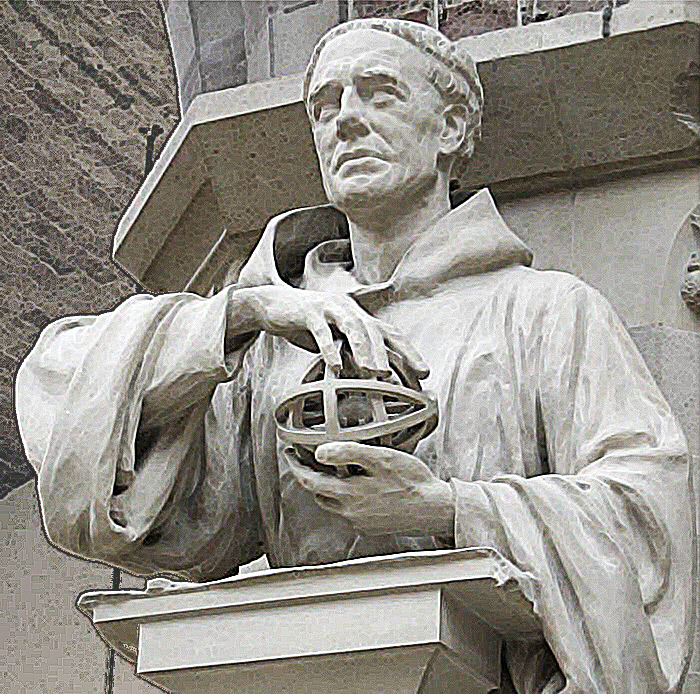 English Franciscan Friar often credited with inventing the scientific method. Italian Catholic physician who developed fractional distillation. Spanish Catholic (and Franciscan tertiary) who invented a device considered to be the first computer, earning him the title the "Father of Computer Science" (he was beautified by Pope Pius IX in 1857). German Catholic priest (and Dominican friar) who gave the first correct explanation of rainbows. English Catholic Archbishop, physicist, and mathematician who came up with the Law of Falling Bodies (hundreds of years before Galileo). French Catholic priest and scientist who developed an early theory of inertia and momentum. French Catholic Bishop who invented abstract graphing (pre-Cartesian but which seemed to inspire Descartes' system), first use of fractional components, the first to write about the divergence of harmonic series, and the first to write about general curvature (and, relatedly, the first to discover the curvature of light through atmospheric refraction). Florentine Catholic engineer, architect, and artist who discovered geometric optical linear perspective (and also designed the largest masonry dome in the world, still the biggest to this day). German Catholic Bishop (and Cardinal) who developed the concept of the infinitesimal in mathematics, advanced theories regarding relative motion, and conducted first formal modern experiment in the history of biology (it pertained to how plants received nourishment from air). Italian Catholic priest whose great talents earned him the titles "Father of Modern Architecture," "Father of Modern Surveying," and "Father of Western Cryptography." German Catholic Bishop, astronomer, and mathematician considered by many as the "Father of Modern Astronomy" and was among the first to use symbolic algebra. Italian Catholic scientist who, in addition to writing extensively about anatomy, geology, astronomy, and botany (and many others), is the person credited with starting the Scientific Revolution. German Catholic mathematician who, among other things, came up with the plus sign (+) and minus sign (-) still used today. German Catholic cartographer, considered by some as the "Father of Modern Geography" (he was the one to coin the term "America" to describe the continent(s) of the western hemisphere). Polish Catholic cleric, famous for formulating a heliocentric model of the universe (and, contrary to popular belief, was NOT persecuted by the Church at all). Italian Catholic metallurgist considered the "Father of the Foundry Industry" and the first scientist to isolate the element Antimony. German Catholic scientist known as the "Father of Mineralogy." Italian Catholic mathematician and engineer who came up with the formula to solve cubic equations and the first to apply mathematics to projectiles, earning him the title the "Father of Ballistics." Italian Catholic mathematician, physician, and astronomer who was the first to make systematic use of numbers less than zero. Flemish Catholic physician, considered to be the founder of the modern study of human anatomy. Italian Catholic anatomist who discovered the pulmonary circuit, which lead to the discovery of the circulation of blood. Italian Catholic mathematician who came up with the formula to solve quartic equations. Gabriele Falloppio (1523-1562) a.k.a. "Fallopius"
Italian Catholic cleric, anatomist, and physician, after whom the Falloppian Tube of the reproductive system is named (as well as the aquaeductus Falloppii). Italian Catholic anatomist, considered the "Father of Embryology." Spanish Catholic priest (and Jesuit) who gave the first detailed description of the geography and culture of the New World and is also considered a pioneer of the Geophysical Sciences. French Catholic mathematician, considered to be the "Father of Modern Algebra." Italian Catholic surgeon who pioneered plastic and reconstructive surgery (successfully performing skin autografts). Belgian Catholic priest (and Jesuit) who laid the foundation for Prospective Geometry (he was the first to use the term "stereographic"). Flemish Catholic scientist who wrote the first definitive work on modern mineralogy. German Catholic priest (and Jesuit), physicist, and astronomer who accomplished the first systematic study of sunspots. French Catholic theologian, considered the "Father of Acoustics." French Catholic mathematician who invented the Cartesian coordinate system and analytical geometry. Italian Jesuit priest and astronomer who was the first to measure the acceleration due to gravity of falling bodies (and the one to devise the current modern scheme of lunar nomenclature). French Catholic mathematician whose work led to infinitesimal calculus (famous for "Fermat's Last theorem"). Italian Catholic physicist and mathematician who invented the barometer and after whom the Torr unit is named (which measures pressure). Catholic Italian physicist and mathematician, considered founder of Biomechanics. Italian Catholic priest (and Jesuit priest) who was the first to make accurate observation on the diffraction of light (and was the one to coin the term "diffraction"). French Catholic priest and astronomer who was the first person to measure the size of the earth to a reasonable degree of accuracy (and is one of the scientists considered to be the "Father of Modern Astronomy”). French Catholic mathematician and physicist who laid the foundation for probability theory, invented an early calculator/computer, and made important theories and experiments regarding pressure and vacuums (the unit “pascal" is named after him). Flemish Catholic priest (and Jesuit) who built the first steam-powered vehicle. French Catholic mathematician and astronomer who discovered the first four moons of Saturn. Italian Catholic doctor who founded Comparative Physiology and is considered the "Father of Microscopic Anatomy" (and was a physician and personal friend of Pope Innocent XII). Italian Catholic priest (and Jesuit), considered the "Father of Aviation/Aeronautics." Danish Catholic Bishop, considered the Founder of Modern Geology and Stratigraphy (he was beautified by Pope John Paul II in 1988). Italian Jesuit mathematician who was the first in the modern age to pioneer into non-Euclidean geometry. Italian Catholic anatomist known as the "Father of Histology" (the study of the microscopic structures of tissue). Italian Catholic anatomist, considered the "Father of Modern Anatomical Pathology." Italian/Slavic Catholic priest (and Jesuit) who developed modern atomic theory and the theory of relativity (200 years before Einstein, according to Tesla). Scottish Catholic (and Benedictine Monk) who invented the first electric motor. Spanish Catholic scientist who was the first to discover and isolate the element Platinum. Italian Catholic mathematician who wrote the first book discussing both differential and integral calculus (and the most important woman in mathematics for over a millenium, earning her great honor from the Pope). Italian Catholic priest who was the first to come with the theory of animal echolocation (and is one of the scientists considered to be the "Father of Modern Biology"). Italian Catholic physician, physicist, and biologist who pioneered the field of bioelecricity/bioelectromagnetics (the terms "galvanism" and "galvanization" are named after him). French Catholic physicist who came up with the definition of the electrostatic force of attraction and repulsion (the SI unit of electric charge called the "coulomb" was named after him). French Catholic chemist, considered the "Father of Modern Chemistry," coming up with the first table of elements (and invented the terms "oxygen" and "hydrogen"), theorized that mass always stays the same, and was one of the main people to come up with the metric system (and he defined the unit that was later termed the "kilogram," which is what grams would be based off of). Italian Catholic physicist who invented the battery and after whom "voltage" is named (and accordingly the unit "volts"). Italian Catholic priest, mathematician, and astronomer who discovered and named the dwarf planet Ceres (the largest asteroid in the solar system). French Catholic priest and zoologist, considered the "Father of Modern Entomology" (the study of insects). French Catholic chemist who discovered the elements Beryllium and Chromium (and discovered the first amino acid, namely asparagine). French Catholic physicist, astronomer, and mathematician who made important breakthroughs regarding the polarization of light, magnetism, and electricity (the “biot” unit is named after him, which measures electric current). French Catholic physicist, founder of the science of Electromagnetism and after whom the unit "ampere" (i.e. "amps") is named (he also discovered the element Fluorine). French Catholic chemist and physicist who discovered the element Boron (and came up with Gay-Lussac's Law regarding the volumes of gases undergoing reaction at constant pressure and temperature). French Catholic physician who invented the stethoscope (in addition to advancing the understanding of many widespread diseases). Bohemian Catholic priest and mathematician who gave the first purely analytical proof of the fundamental theorem of algebra. French Catholic Priest who is considered the "Father of Modern Crystallography." French Catholic chemist who was a pioneer in gerontology (the study of aging). German Catholic optician who discovered Fraunhofer lines in the Sun's spectrum, laying the foundation for spectrum analysis. French Catholic engineer and physicist who significantly developed the study of wave optics (establishing "Fresnel Equations," which describe the behavior of light moving between media of differing refractive indices). French Catholic mathematician, after which more concepts and theorems are named than any other mathematician. Hungarian Catholic priest, considered the father of the dynamo and electric motor. Italian Catholic priest (and Jesuit) and astronomer who discovered the six new comets, as well as the gaps between Saturn's rings (a lunar crater and a major asteroid are named after him). German Catholic physiologist who founded the theory of the cellular structure of animal organisms (he also coined the term "metabolism"). French Catholic astronomer and mathematician who was the person who discovered the planet Neptune. French Catholic botanist who discovered pleomorphism in fungi (the ability to assume radically different forms) and earned the title the "reconstructor of mycology" (the study of fungus). Hungarian Catholic physician whose work in antiseptic methods earned him the title the "Father of Infection Control" (also gaining the title the "Savior of Mothers" for the resulting lives saved from childbirth). Italian Catholic priest (and Jesuit), considered the "Founder of Astrophysics" for developing the first system of stellar classification (and was the first to scientifically assert that the sun is a star). French Catholic physicist who was the first to measure the speed of light on earth. Canadian Catholic priest, considered the "Father of Natural History in Canada" for discovering and describing thousands of new species of insects and wrote the first French-language scientific journal in Canada's history. Italian Catholic priest and engineer who invented the internal combustion engine. Polish Catholic scientist who discovered how to distill petroleum into kerosene and invented kerosene lamps, the first modern street lamps, and the first modern oil well and oil refinery, which started the Oil Revolution (he was honored by the Pope for his scientific accomplishments). Austrian Catholic priest (and Augustinian monk) and scientist who founded the science of Genetics. French Catholic chemist, considered the "Father of Microbiology" and the founder of bacteriology (and invented "pasteurization," which was named after him). Belgian Catholic Priest who founded the science of cytology (the study of cells). Irish Catholic engineer who developed the first practical submarine (many submarines are named after him). French Catholic physicist who invented the first sensitive device for detecting radio waves. German Catholic physicist who discovered X-Rays (he won a Nobel Prize for this). Italian Catholic priest and volcanologist who developed a way to measure the magnitude of earthquakes (the Richter scale was based on this). Catholic French physicist who discovered radioactivity (he won a Nobel Prize for this), resulting in his name becoming the unit for the measurement of radioactivity (the "becquerel" unit). Japanese Catholic chemist (and immigrant to the United States), considered the "Father of American Biotechnology." American Catholic priest (and Jesuit) whose study of earthquakes made seismology known as "The Jesuit Science." Brazilian Roman Catholic priest and scientist who demonstrated the first wireless radio broadcast of a human voice. Catholic Austrian biologist who first categorized the main blood groups (Type A, B, AB, etc.). French Catholic biologist who invented the perfusion pump, making organ transplants possible (he won a Nobel Prize for this). Hungarian Catholic radiochemist who discovered the element Hafnium (he won a Nobel Prize for this). Belgian Catholic priest, physicist, and astronomer who first proposed the theory of the Big Bang (which Einstein famously disagreed with until Lemaître scientifically defeated his objections).